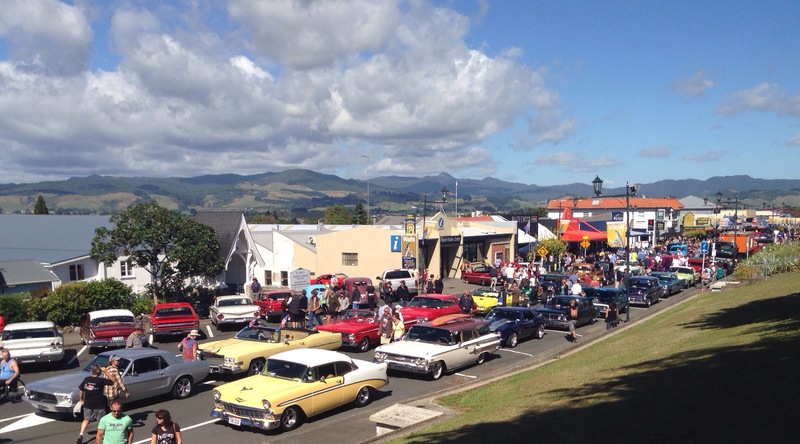 Passing through Waihi we stumbled into a big Hot Rod Show. I think every Hot Rod in New Zealand was there, it was huge! The main street was closed off, the sky was blue, it was hot like summer, there were hot rods everywhere all gleaming, polished and shiny, some dudes standing next to ‘rods with their chest puffed out all proud, local market stalls and shops, little kids all excited on school excursions, bands playing Elvis and Rockabilly music, ladies dressed in their finest full skirts covered in polka dots, sausage sizzles wafting thru the air, the joint was jumping! Waihi was bursting at the seam with happy activity. This entry was posted in Photography, travel and tagged hot rods, new zealand, postcards, travel. Bookmark the permalink.